Ottawa Sun PORTLAND -- If Smiths Falls is the rough geographic centre of the Rideau Canal system, then Portland is the nerve centre of Rideau Lakes cottage country. Of course, as the only town on Big Rideau Lake, Portland really had no choice in the matter. There are 1,500 cottages on the lake, and as a result, the town doesn't so much live for itself as it does for the Big Rideau and the steady boat traffic fed to it by the canal from the directions of Ottawa and Kingston. Portland should be used to it by now. Its entire existence has been based around the idea of transit, around commodities -- be they human or freight -- passing through. The site was first developed in the 1820s as the Landing, essentially a launching point for settlers boarding barges bound for Perth. By the time it became Portland in 1842, it was a healthy farming community shipping produce up and down the young Rideau Canal. Now, it's a healthy resort community shipping people up and down the canal. The water sits like glass in the Westport harbor. What was once a "floating bog" is now a thriving resort area thanks to community support. "There are more boats in Portland than there are anywhere else on the Rideau," says Doug Horsfall, owner of Len's Cove Marina -- one of five such operations lining the town's waterfront. "There are more boats than there are people, but of course the people of Portland don't own the boats," he explains. That's an irony borne out by the contrast between the relatively modest dwellings on the shore in Portland proper and some of the more majestic cottages dotting the lake -- not a few of which are worth between $400,000 and $500,000. Once you factor in the hundreds of boaters who treat their vessels as floating cottages that never venture far from the marina, the actual population of Portland is far outnumbered by seasonal visitors during prime boating months. "They may not pay taxes, but they allow a lot of businesses to pay their taxes," says Horsfall. "If you do anything to discourage the tourists, you're shooting yourself in the foot. So you do everything you can to encourage them." Horsfall has worked at Len's Cove Marina since he was 11 years old, when his father -- in need of a lifestyle change -- uprooted the family and moved it to Portland in 1958. "My dad was in a pretty high-pressure sales job in Toronto, and he knew if he didn't get out of that job it would probably kill him," he says. "I give him a lot of credit for having a vision at that time, having the guts to drop everything and move his family." The business now occupies most of the cove named after Horsfall's father -- who passed away in 1975 -- encompassing a small cabin operation that caters mainly to visiting U.S. fishermen, a boat sales and repair shop and several three-storey honeycombs packed during the winter months with dry docked boats. Still, as busy as he is, Horsfall and his fellow Portland businessmen are hoping to use the low Canadian dollar to lure even more American boaters northward through the canal system. The low dollar and the Big Rideau itself, that is. "The lake was developed here pretty early," he says. "There are cottages on the lake here that must be 100 years old. Because of that, a lot of the properties are pretty large tracts of land and they're owned by families who never felt the cash crunch to sell them. So there's a lot of what appears to be undeveloped property on the lake. "It's a very appealing lake in that way. It's not wall-to-wall cottages. And that's why a lot of the boaters like it. They can pull up to the shore without worrying about being in somebody's view." Gary "Fetch" Murphy relaxes in his Westport barbershop and fishing tackle store. The 62-year-old has been trimming area locks for 45 years. Liz Moore's family has owned a cottage on McAdam Island, officially known as Island No. 60, since 1902. The old Kingston-to-Ottawa steamboat, Victoria, used to moor off its shore, part of the lake's rich history that inspired her mother, D. Jane Moore, to write the book Rideau Passages in 1982. Moore has been cruising on the lake since 1967, when she was still "bouncing along in the boat in my mother's womb," and her love for the Big Rideau has kept her in Portland all her life. Not surprisingly, she now makes a living -- albeit less directly than Horsfall -- from the lake, running a bed-and-breakfast known as Steamboat Landing. "In my family it will always be the one property that we cherish, no matter how many properties we have," she says of the family cabin. "I mean, I like this house and I'm very attached to it, but I'd sell this before I'd sell the island." Back on the shoreline, Ottawa refugees Heather and Robert Heins have turned the old general store they purchased -- ostensibly as a home two years ago -- into the Waterfront Restaurant. The place has a long and checkered past: Former Premier Bob Rae toiled there as a stockboy in its days as Scovil's Store, while at the turn of the century it served as a supply depot for the steamboats that carried passengers from Ottawa to Kingston at $3 a head. The Heins reckon only about 5% of their business is local. The boaters keep them going during the summer, and during the winter they even get the occasional snowmobiler roaring in from an icebound cottage on the lake. "We don't rely on local business at all," says Heather. "Without tourism, we would die." COLONEL BY ISLAND -- Nowhere on Big Rideau Lake, perhaps, is there a more fitting emblem of the area's well-established cottage culture than Colonel By Island -- a truly surreal spot at the top of a cluster of islands in the centre of the lake. Home to a fishing lodge called the Angler's Inn during the 1890s, the island has as its centrepiece these days a sprawling maroon, glass-fronted cottage built for business tycoon Danny Arnstein in true 1950s modern architectural style. Apart from its tennis court, the structure has now largely gone to seed. But the plaque out front recalls its swinging heyday when the likes of David Niven, Paul Anka and Fanny Boyle would whoop it up on the Big Rideau. The wind-lashed island is now owned by Parks Canada, and provides boaters daring enough to moor in its precariously rocky cove with a place to camp, picnic, hike or play tennis on the route between Portland and the Narrows Lock, just off to the west. By the time you've reached the lock station -- cupped in by a small bay separating the Big Rideau from the Upper Rideau Lake -- it's clear a major shift is under way along the shore, geographically speaking. The Canadian Shield is beginning to assert itself, rearing out of the water in jagged rock formations and thick softwood stands. A quick hop through the negligible 0.9-metre (3 feet) lift of the Narrows Lock, and the Y-shaped Upper Rideau opens up before you -- a rippling bed of gold dotted by bass boats wringing a few extra minutes' worth of fishing out of the sunset. Tucked away in the westernmost corner of the lake, the forest-shrouded hills give way to open meadows and the village of Westport, a de rigueur destination for any canal traveller. A massive blue heron skims the midday waters of the Rideau Canal. 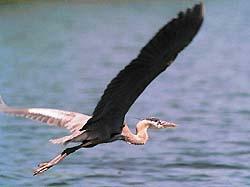 It's hard to pass a day on the river without encountering at least one of these majestic birds. WESTPORT -- On a microcosmic level, barber Gary "Fetch" Murphy has discovered the same formula for success as his home town of Westport: When times get tough, locate your strengths and run with them. Murphy, 62, has been cutting hair in the heart of Westport's shopping district for 45 years, but about 15 years ago the scalp-shearing business took an unexpected dive. "I had to do something because the long hair came in," he says, completely serious. "I still had a wife and kids to feed, so it seemed like a good idea to sell bait and tackle." The barber's chair and mirrors in Murphy's shop have been surrounded by ranks of Big Bass lures, jigs and containers of bait ever since. And business is raging, if the flood of customers -- most of whom seem to know Fetch by name -- stopping by the store to pick up their newspapers, lottery tickets and live bait this morning is any indication. In fact, these days Murphy only cuts hair in the mornings by appointment "because it gets so damn busy. "The town wasn't near as busy 15 years ago," he recalls. "There were a lot of stores closing down. She was pretty slim pickings for a year or two. Now, every weekend in the winter even, the hotels are packed. Once people have been here, they come back." Westport's rejuvenation stems from the same basic idea as that of Murphy's barber shop. It capitalized on the things it had always been known for -- fishing and boating. The revitalization effort really took off about seven years ago, when the community of 700 pulled together $175,000 in donations and government grants to give its waterfront a much needed facelift. "It was just sort of a swamp and there was inferior docking there," says Mendal McEwen, the local dentist and chairman of the town's harbor committee, whose office overlooks the waterfront. "It obviously needed grooming and dredging. We're blessed with a very beautiful natural area here and that in itself is an attraction. But if you make the amenities available, people will come back and spread the word around." An arched stone bridge now connects the mainland to the smoothly landscaped breakwater laden with picnic tables and young birch trees that forms the heart of Westport's expanded municipal harbor. Last year, the local chamber of commerce also brought in a highly prized -- and all too rare -- commodity for any boater: Hot showers. Combined with the village's reputation as a shoppers' paradise and a quaint gingerbread village, the upgraded facilities are luring a small, but dedicated -- and growing -- core of boaters off the main navigational route of the Rideau Canal. In fact, McEwen notes, while boat traffic on the Rideau dipped a bit three years ago, Westport's visitor numbers have actually gone up. Greeting all boaters mooring at the harbor with equal verve is the jovial figure of "Captain" Jack Hearn, a self-described "old coot" and local harbormaster. Hearn, 66, gave up his job as a mechanic for Air Canada 20 years ago for a new start in Westport. He's since taken on a second career collecting mooring fees from the 50-or-so boats that pull up beneath his harborfront residence every evening. "My wife and I came in by boat from Montreal," he recalls. "I wasn't happy and the house was for sale, so we bought it. And that was that. We travelled back and forth from the lawyer's office in Smiths Falls by boat, made the deal and closed it. "We were just on a merry little trip down the Rideau and we liked it better here than there, so I deserted." When mooring fees were introduced, it made sense to give the task of collecting them to him. Westport's waterfront is home to all forms of life. This birdhouse stands like a sentinel at the entrance to the harbor. Facilities for the boaters were scarce in those days. Hearn left the keys in his car so anyone who needed to make a supply run could borrow it. There were no public washrooms, so he left the toilet at the back of his house open -- until the long lineups started turning ugly as boaters jostled for prime positions in line. "I finally put up a dartboard so they could win their turn at the washroom," he chuckles. "But I had to take it down because they were scrapping over who'd won." His generosity has paid off in spades. "I think they've all become friends since then, anybody who I've met," he says. "They stop in and see me, even in the wintertime." Two of those friends are Jerry and Shirley Lake, of Manotick, who've known the good captain since they first moored at Westport in the summer of 1979. This evening, they've plied Hearn away from his rounds with a couple of cans of Old Milwaukee to swap stories of the good old days on the canal -- stories of pranks played on lockmasters, of foolish mishaps by fellow boaters, of the time Hearn discovered $300 in gas money tucked under the mat in his car by grateful boaters. "That's what it takes," says Jerry. "You get three or four old boaters who come together, you get into the old stories. We keep in touch, so when we get together in the summertime it's like we never left off. "You don't get the parties like you used to, but that's fine for me -- I can't party like I used to." For the past 12 years, the Lakes have been cruising the canal in Triton's Trumpet -- a monstrous 49-foot steel trawler that Jerry, a steelworker, spent three-and-a-half years slapping together in an Ottawa industrial park. "I knew what I was doing," he says. "I just didn't realize how big it would turn out." 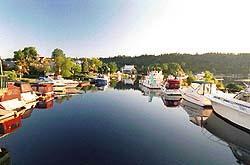 Of all the destinations, though, Westport has remained their favorite. In fact, Jerry says, they're among the growing ranks of summer boaters who return to Westport in the winter to go Christmas shopping or skiing in the wooded conservation area overlooking the village. "This," he says, gesturing to the reflection of the smudged clouds and pink aura of the sunset dancing on the still harbor. "The tranquility of it. Look at those highlights on the water. It's just gorgeous. It's a little piece of heaven."